When I moved into my apartment in fall 2013, the long wall behind the TV desperately needed some decorations. While playing around with band combinations in some Landsat imagery at work, I stumbled upon an idea: a series of prints of multispectral remote sensing imagery with different band combinations. 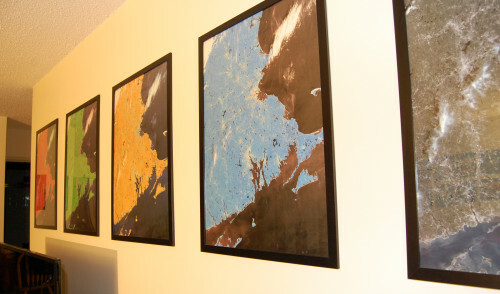 The series would resemble Warhol’s multicolored Marilyn Monroe prints, except that the striking color palettes would represent actual band combinations used in the remote sensing field to highlight different surface characteristics. The prints depict a mostly cloud-free view of eastern Massachusetts, Rhode Island, southern New Hampshire, eastern Connecticut, and the tip of Long Island. The prints lack the usual accoutrements of maps like state outlines, legends, north arrows, and scale bars. For this reason, it takes many visitors a minute to realize they are maps and not some kind of abstract print. 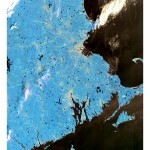 I made these prints in ArcGIS using two scenes from the Operational Land Imager (OLI) onboard the $850 million Landsat 8 satellite. 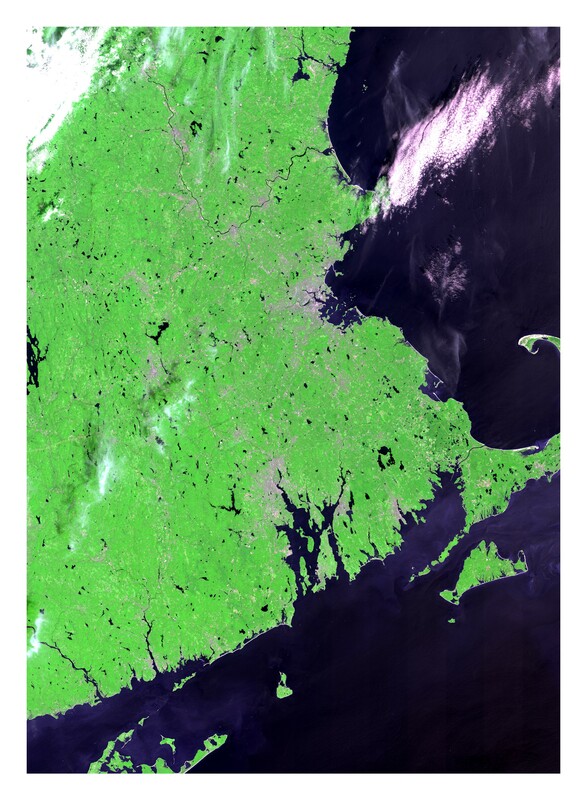 The publicly available LC80120302013250LGN00 and LC80120312013250LGN00 scenes were captured sequentially as Landsat 8 passed over from northeast to southwest at 11:30am EDT on Saturday, September 7, 2013. 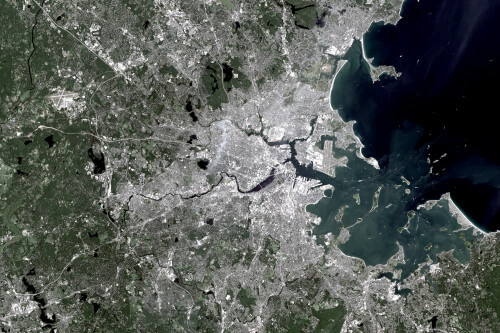 The tilt of the prints occurs because Landsat 8 orbits at a slight angle from due north so it can pass over different parts of the Earth. 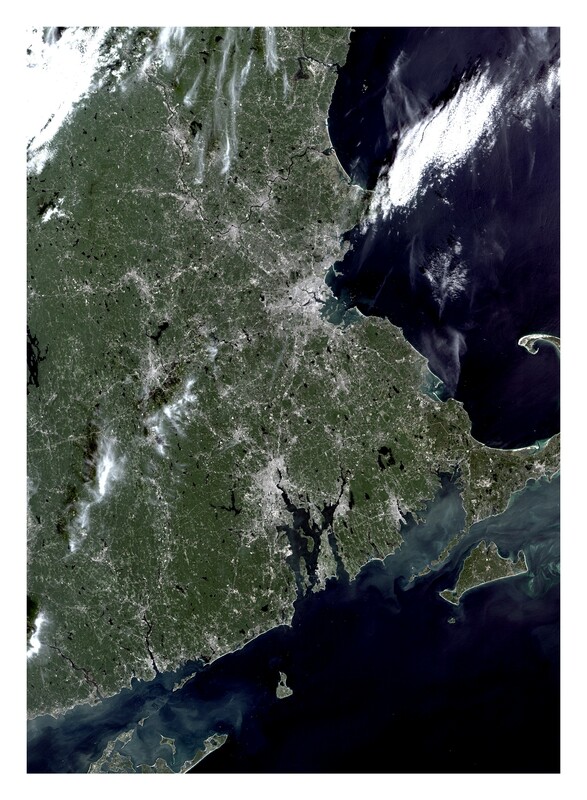 Luckily, rows 30 and 31 in path 12 of the Landsat Worldwide Reference System include almost all of eastern Massachusetts; only Nantucket and part of Cape Cod are missing. Normal digital cameras only have sensors for red, green, and blue: the same primary color receptors in the cones of our eyes. 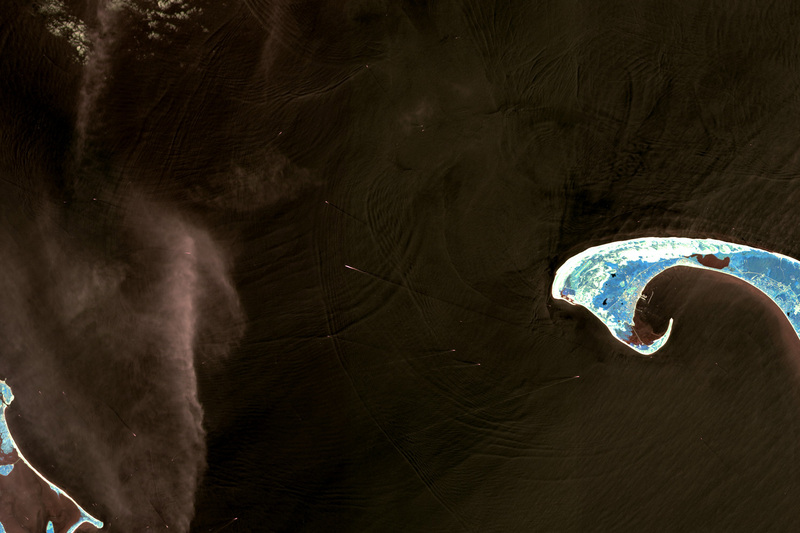 The OLI, like the sensors onboard earlier Landsat satellites, is also capable of detecting many bands of near infrared light. 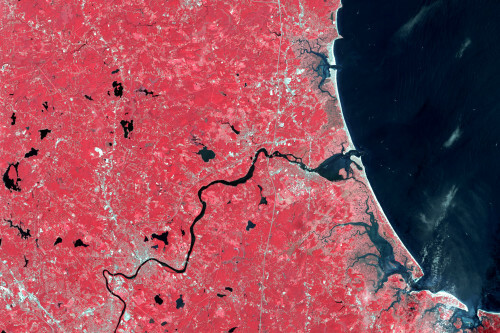 By substituting red, green, and blue with these infrared bands in a so-called “false color” image, a remote sensing scientist can easily detect patterns and trends that are invisible in a “natural color” image. The inevitable stunningly bright color palette of these band combinations inspired these Warhol-esque prints. Detail of Boston, MA in 4-3-2 “natural” color. With 15 meter spatial resolution, individual boat moorings can be seen in Boston Harbor. 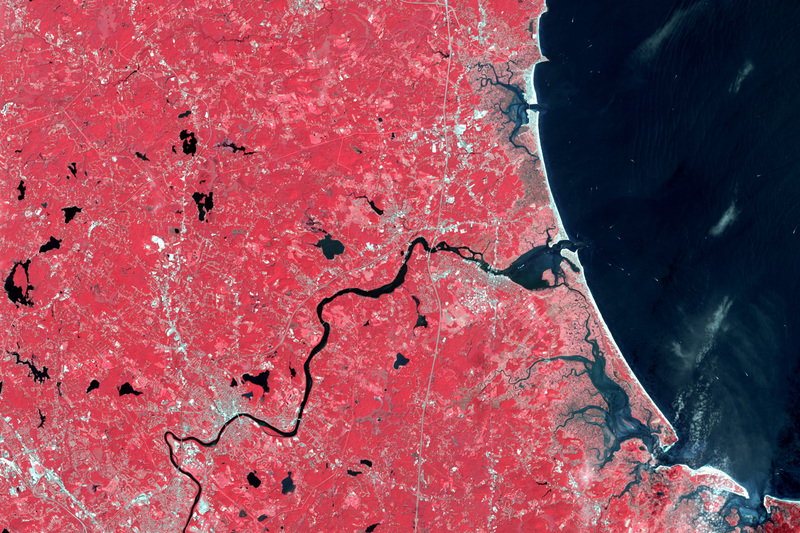 Detail of Plum Island, MA in 5-4-3 false color. This band combination highlights differences in vegetation, such as forests and coastal salt marshes. 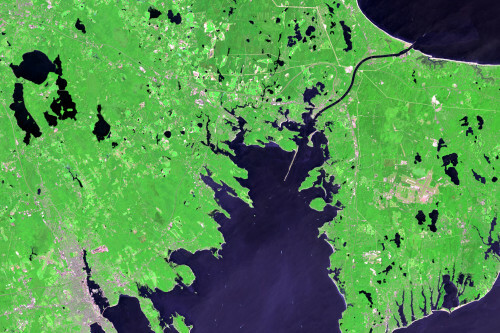 Detail of Buzzards Bay, MA in 5-7-3 false color. This band combination highlights urbanized areas in purple and differences between vegetation types in green. 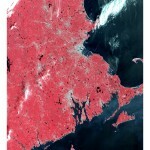 Detail of Providence, RI in 5-6-2 false color. Note the yellow-green grass at TF Green Airport compared to the yellow forests. Detail of Provincetown, MA in 4-6-5 false color. Note the diffraction pattern of waves rounding the tip of Cape Cod. The full prints are downloadable below at 100 dpi (2,200 x 3,000, 2 MB each). 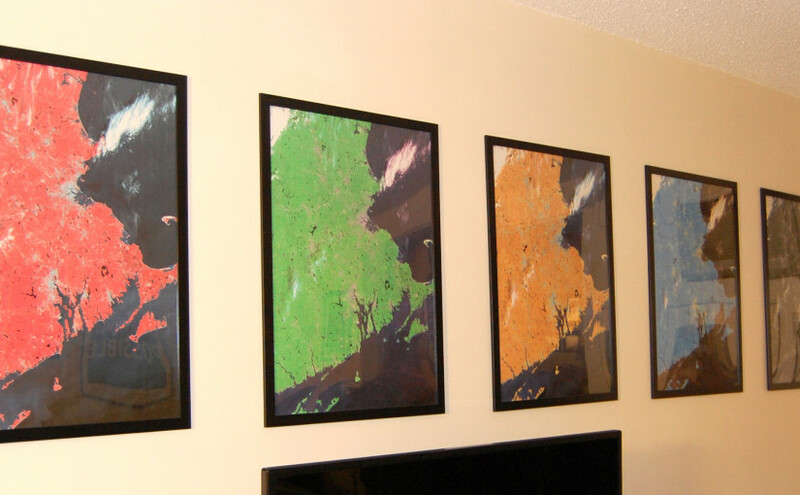 If you’d like to get your own prints made, you’ll want to use higher resolution images. 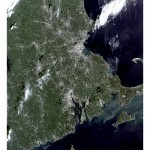 I’ve uploaded the prints to Flickr at 300 dpi (6,600 x 9,000). 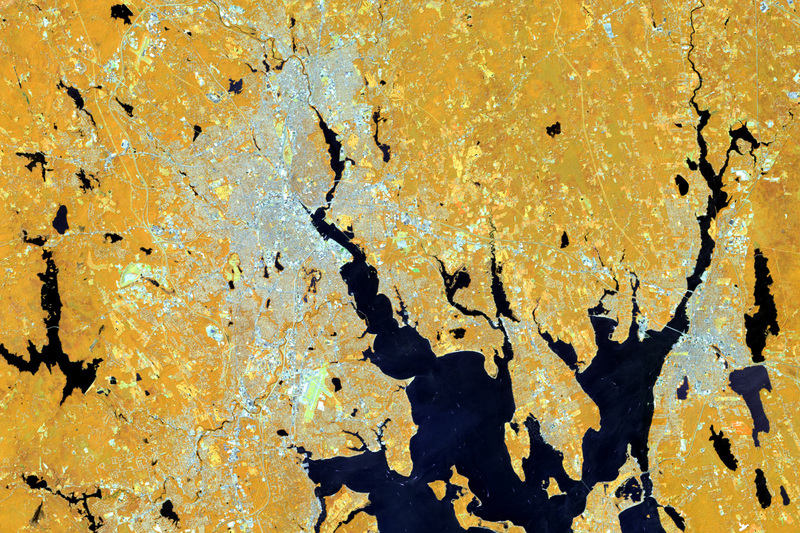 Send me an email if you’re interested in the ridiculously high resolution 600 dpi images.